Does the UK engage in ‘mass surveillance’? When giving evidence to the Parliamentary Committee on the Draft Investigatory Powers Bill Home Secretary Theresa May stated categorically that the UK does not engage in mass surveillance. The reaction from privacy advocates and many in the media was something to see – words like ‘delusional’ have been mentioned – but it isn’t actually as clear cut as it might seem. Both the words ‘mass’ and ‘surveillance’ are at issue here. The Investigatory Powers Bill uses the word ‘bulk’ rather than ‘mass’ – and Theresa May and her officials still refuse to give examples or evidence to identify how ‘bulky’ these ‘bulk’ powers really are. While they refuse, the question of whether ‘bulk’ powers count as ‘mass’ surveillance is very hard to determine. As a consequence, Theresa May will claim that they don’t, while skeptics will understandably assume that they do. Without more information, neither side can ‘prove’ they’re right. The bigger difference, though, is with the word ‘surveillance’. Precisely what constitutes surveillance is far from agreed. In the context of the internet (and other digital data surveillance) there are, very broadly speaking, three stages: the gathering or collecting of data, the automated analysis of the data (including algorithmic filtering), and then the ‘human’ examination of the results of that analysis of filtering. This is where the difference lies: privacy advocates and others might argue that the ‘surveillance’ happens at the first stage – when the data is gathered or collected – while Theresa May, David Omand and those who work for them would be more likely to argue that it happens at the third stage – when human beings are involved. 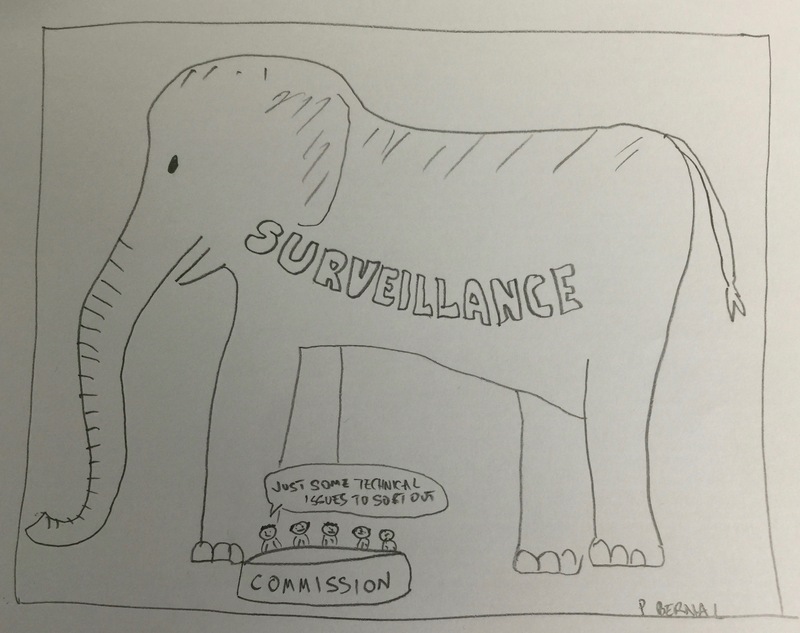 If the surveillance occurs when the data is gathered, there is little doubt that the powers envisaged by the Investigatory Powers Bill would constitute mass surveillance – the Internet Connection Records, which appear to apply to pretty much everyone (so clearly ‘mass’) would certainly count, as would the data gathered through ‘bulk’ powers, whether it be by interception, through ICRs, through the mysterious ‘bulk personal datasets’ about which we are still being told very little. If, however, the surveillance only occurs when human beings are involved in the process, then Theresa May can argue her point: the amount of information looked at by humans may well not be ‘massive’, regardless of how much data is gathered. That, I suspect, is her point here. The UK doesn’t engage in ‘mass surveillance’ on her terms. Who is right? Analogies are always dangerous in this area, but it would be like installing a camera in every room of every house in the UK, turning that camera on, having the footage recorded and stored for a year – but having police officers only look at limited amounts of the footage and only when they feel they really need to. Does the surveillance happen when the cameras are installed? When they’re turned on? When the footage is stored? When it’s filtered? Or when the police officers actually look at it. That is the issue here. Theresa May can say, and be right, that the UK does not engage in mass surveillance, if and only if it is accepted that surveillance only occurs at the later stages of the process. In the end, however, it is largely a semantic point. Privacy invasion occurs when the camera is installed and the capability of looking at the footage is enabled. That’s been consistently shown by recent rulings at both the Court of Justice of the European Union and of the European Court of Human Rights. Whether it is called ‘surveillance’ or something else, it invades privacy – which is a fundamental right. That doesn’t mean that it is automatically wrong – but that the balancing act between the rights of privacy (and freedom of expression, of assembly and association etc that are protected by that privacy) and the need for ‘security’ needs to be considered at the gathering stage, and not just at the stage when people look at the data. In practice, too, the middle of the three stages – the automated analysis, filtering or equivalent – may be more important than the last one. Decisions are already made at that stage, and this is likely to increase. Surveillance by algorithm is likely to be (and may already be) more important than surveillance by human eyes, ears and minds. That means that we need to change our mindset about which part of the surveillance process matters. Whether we call it ‘mass surveillance’ or something else is rather beside the point.